Early this summer I decided I was not happy with my previous n-scale layout. A move to a new home forced me to disassemble my previous small layout (it would not fit down a hallway into the new space I had for a layout). 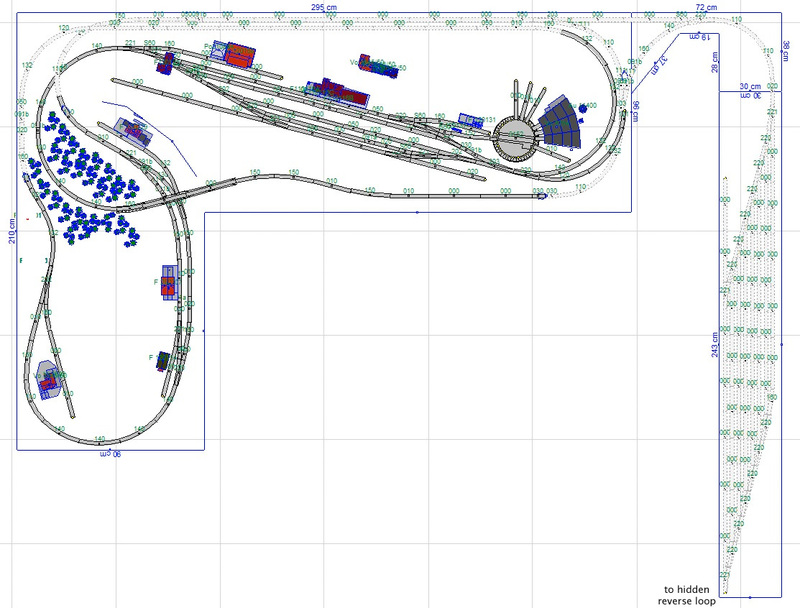 I was eager to get something built again and rushed into planning and building a new layout. In our house I have a 12 x 9 foot room available to me but it is down a hallway with an awkward tight corner. I didn’t want the layout to be ‘trapped’ in the train room so I decided to build an L-shaped layout made up of 3 modules that could be taken apart so the layout could leave the room if needed. I had a couple of old Ikea desktops laying around that perfectly fit the layout dimensions I wanted so decided to use them as a foundation. The desktops are constructed much like a hollow core door so they were strong, dimensionally stable, and well, they were free at the time. I also decided to use blue foam insulation board to build up the scenery and layout base. I had used it before and it was lightweight, very easy to work with, and combined with the desktops did not require any power tools or carpentry skills to build out. 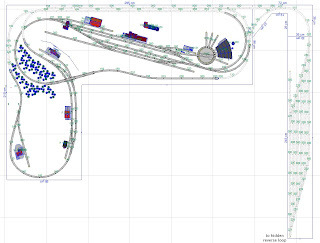 I loved working with Marklin C-track when I was planning and building an HO layout years ago. It appealed to me as I always end up planning layouts somewhat ‘on the fly’ and adjusting track plans as things are built. Because of this I had decided to use Kato Unitrack in N-scale – it is probably the closest thing to C-track in N and reviews and comments around the internet spoke to its high quality and ease of use. Benchwork: The combination of the desktops and foam made it awkward to work under the layout. I had found a long ¼ inch drill bit that made it easy to drill holes down through the foam and desktops for wiring but I wanted to do more. 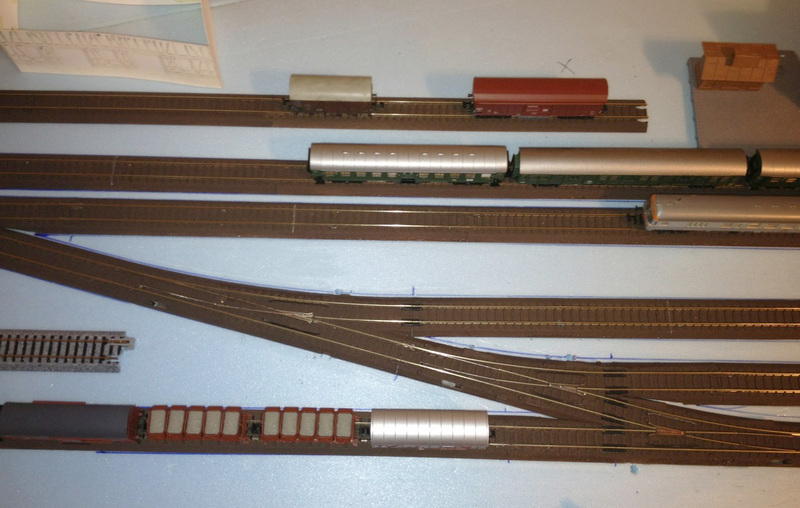 Signals and a small Faller car system roadway were on my list of must-haves and I was getting frustrated trying to figure out the best way of adding them in a way that the scenery would not have to be ripped up to maintain or repair them. The layout also turned out a LOT heavier that I had planned. This made it awkward to work on the sides against the wall as my plan to allow it to ‘slide’ a bit on the sawhorse ‘table’ supporting it did not work out due to the weight and the wiring etc under the desktops. This meant a lot of reaching over the layout’s 30” plus width was in my future. I knew that was not going to work in the long run. Track: I liked the ease of working with the Kato Unitrack and once it is fixed to the layout and tweaked where needed, my trains ran perfectly. I had done a good job of planning out wide sweeping curves and easements with the Unitrack and once painted it was hard to tell it was even sectional track. However after the track was laid I had the opportunity to see a layout built with Peco Code 55 Streamline track and found the closer-to-scale appearance of the Peco track was something I really liked. Once I started to ballast the Unitrack (add ballast to the plastic roadbed) the wider tie spacing and code 80 track height of the Unitrack really stood out to me. It also became obvious the Unitrack was going to take a very long time to ballast well and the shortfalls in the benchwork would make it very awkward to do in many areas. With these issues and others weighing on me, I went back and forth about starting over again – I would make a decision to rebuild, spend some time enjoying running trains and then decide to keep going, only to change my mind a week or two later. In June this year I started to plan a new layout just to see what I could improve on and this finally pushed me off the fence and I started getting serious about starting over. A few weeks later the old layout was taken apart - with the Unitrack, electronics & wiring, and even the desktops salvaged for re-use. The lessons learned? Don't rush into a permanent layout but don't be afraid to start over if things are not progressing the way you want. Next – planning a new layout. Great post and great advice! I love Unitrack and started my own layout with 100% Unitrack, but I agree that it can be limiting, and when you are exposed to Peco code 55...yeah...I know the feeling! Enjoying the new blog! Thanks, great post, I will heed your advice!